Difference between revisions of "Structure"
Colonists can build structures of a various materials, each with different beauty, flammability and hit-points. 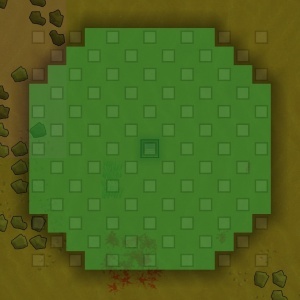 Enclosed areas will automatically prompt colonists to build a roof unless you apply a no roof region, or if the structure is too large (over 300 cells). Structures leave ash on the ground when burnt. Walls are impassable structures capable of supporting a roof. Walls can be built out of any building material. Power conduits may be constructed in an existing wall. Walls require 5 materials to construct. Doors provide entry points through walls for colonists while still keeping out enemies and wild animals. Pawns manually open doors which causes a delay as they try to pass through, as opposed to autodoors which open on demand and allow faster passage. All doors are generally locked to hostile entities, including prisoners, raiders and mad animals. A door can be marked to "Hold open", which means the next time it is opened, it will stay open, and then all pawns can pass through. A door can also be marked "Forbid". Colonists and tamed animals don't use forbidden doors, even if they're held open. However visitors, traders, and colonists on mental breaks ignore the forbidden status. A roof will collapse if the last supporting wall or rock is removed, whether by mining, deconstruction, or destruction. Roof collapses cause injuries to colonists, but don't damage items. If it's an Overhead Mountain collapsing, colonists will be buried alive. Autodoors are powered doors that open as pawns approach, allowing them to move through faster (stone doors) or without slowing at all (all other doors). They require a constant 50W charge to operate. A powered autodoor opens four times as quickly. An unpowered one acts just like a standard door. Autodoors have the same max hit points of a standard door of the same material. A powered door requires at least ~57.69% base speed to not slow colonists down, while unpowered doors require 4x that speed (which excludes all unpowered doors). Like standard doors, autodoors divide areas into separate rooms for room role and stats purposes. Autodoors require 40 steel, 25 materials and 2 components to construct.